China's machinery sector expanded steadily in 2017, driven largely by accelerated industrial upgrading and economic growth. Revenues increased 9.5%, up to CNY 24.54 trillion (EUR 3 trillion). Machinery imports increased 12% to USD 306 billion (EUR 258 billion) while exports grew 8.3% to USD 406 billion (EUR 343 billion). 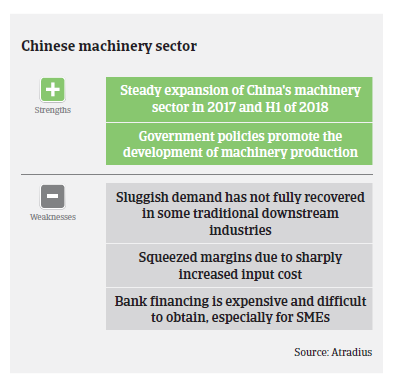 Investment in the machinery sector increased 2.6% to CNY 5.14 trillion (EUR 648 billion) in 2017, marking the end of a deceleration seen in the previous five years. In 2018 production and revenue growth continued, albeit at a slower pace. Added value grew 8.4% in H1 of 2018). 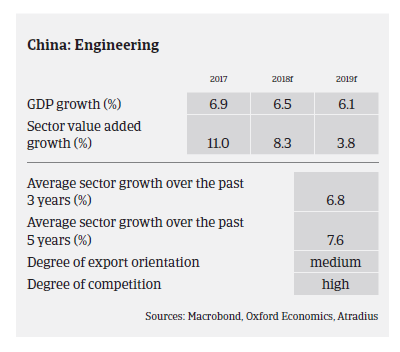 More than 70% of the sector's major subsectors recorded output increases in 2017, especially products related to China's infrastructure development (production of digging machines surged 70% as urbanisation picked up in pace), consumer market and logistics service. That said, agricultural machinery (tractors, harvesters) and power generation equipment output decreased and demand from traditional downstream industries (metallurgy and coal) declined. The Chinese government has recently launched a series of favourable policies to promote the development of its manufacturing industry, which will also benefit the machinery sector. The strategic “Made in China 2025” program encourages enterprises to use high-end machine tools (still there is an oversupply of low-end machinery products but short supply of high-end ones). The government’s implementation of comprehensive tax cuts for productive enterprises also provides support for machinery manufacturers. However, there are substantial challenges ahead. Profit margins of machinery businesses decreased in 2017 and in H1 of 2018 due to sharply increased input costs (up 10% in 2017 and H1 of 2018) for raw materials, labour, transport and financing, while sales prices remained stable. Interest expenses of machinery businesses increased 15.4% in H1 of 2018, exceeding the 6.7% growth in profit ratios. Both large investments in fixed assets and large accounts receivables are the main reasons for high debt ratios in the industry. In H1 of 2018 accounts receivables of machinery businesses increased 12% year-on-year, to CNY 4.67 trillion (EUR 589 billion), accounting for one third of total accounts receivables of all Chinese industries. At the same time, Chinese banks are increasingly reluctant to lend, due to a large amount of non-performing loans accumulated in recent years and the economic slowdown. This less favourable lending policy mainly affects privately-owned small and medium-sized businesses. If bank loans are provided, additional security is usually required, such as fixed assets and personal property guarantees. China's infrastructure development, as a key driver for China’s construction-related machinery segment, could be negatively affected by tighter supervision of public-private partnership (PPP) projects. At the same time, the ongoing Sino-US trade dispute has increased economic uncertainty. Chinese machinery deliveries to the US amounted to USD 110 billion (EUR 93 billion) in 2017, accounting for 27% of total Chinese machinery exports. However, the direct impact of US punitive tariffs on the industry should be limited, as the amount of exports to the US accounts for just 3% of total Chinese machinery revenues, of which only 50% would be affected by additional tariffs. Despite this, a further escalation of the trade dispute could adversely affect major domestic buyer industries of machines. Taking into account both opportunities and challenges, we expect machinery production and revenue to grow at about 7% in 2018. The average payment duration in the Chinese machinery industry is between 90-150 days. As credit conditions have been tightened some smaller and/or privately owned machinery businesses could face liquidity issues, leading to slower payments and even payment defaults. 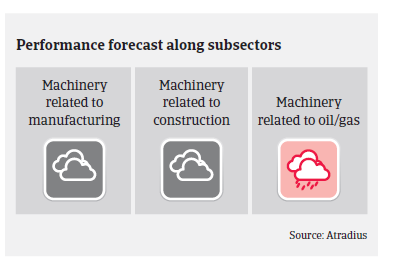 However, no major increase in payment delays or insolvencies in the machinery sector is expected in the coming 12 months. 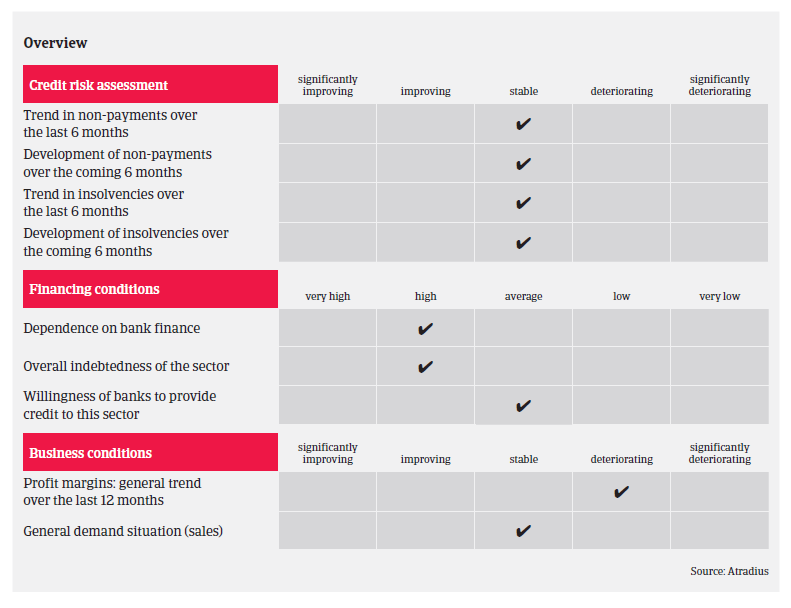 Our underwriting stance is generally neutral, but differs according to the performance of buyer industries, i.e. we are open for automotive-related machinery, neutral on electric-, construction-, and agriculture-related machinery, and restrictive on oil/gas- and mining-related machinery segments.